Recommended Books, Websites, Support Groups and More! News Blog: Read the latest pet health, cancer and amputation news. Discussion Forums: Members share more Tips & Resources. Downloads Blog: Helpful videos, podcasts and e-books. 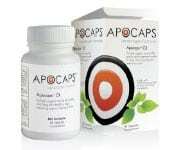 Nutrition Blog: Learn about diet, supplements and nutrition. Amazon Blog: Find product recommendations and reviews. Get all the info you need to help your dog fight cancer in Dr. Dressler’s Kit! Download Tripawds e-books for fast answers to common concerns! Scroll down for more than 100 helpful websites, support groups, clinical trials, financial help resources and more! Check out these books, DVDs, and helpful products we’ve compiled from the best pet products on Amazon. Then hop over to the Tripawds Amazon blog for reviews and more recommendations! Search Amazon to Support Tripawds! Your purchases help keep this community online. DOGS & CATS: Share your story and get fast feedback from members in the Tripawds Discussion Forums. DOGS & CATS: Find more help in the Pets with Cancer support group. DOGS: Visit Bone Cancer Dogs for information about osteosarcoma and bone cancers. DOGS: Lessons from a Paralyzed Dog offers tips and support for dogs with paralysis. DOGS: Get information, resources and canine cancer support at Georgia’s Legacy. CATS: The Vaccine Associated Sarcoma (VAS) Support Group helps cat owners coping with VAS in their feline. CATS: Learn about Vaccine Associated Sarcoma Amputation for Cats at the Pet Cancer Center. CATS: The Cat Cancer Support Group is for anyone coping with a feline cancer diagnosis. 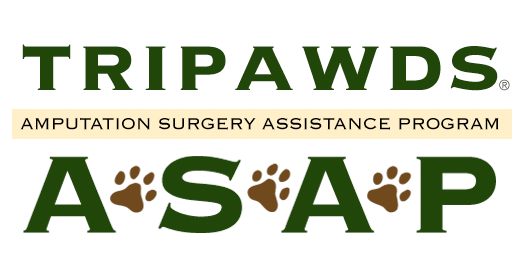 The Tripawds e-book library is the go-to place for Tripawd dog surgery, recovery and post-amputation fitness tips. Find out what to expect for your three-legged dog with Colorado State University expert Dr. Duerr. Get the details on Limb Amputation in Dogs and Cats from the Michigan Ave. Animal Hospital. Discover more information about Limb Amputation in Cats from Petplace.com. Read this PDF about management of Phantom Limb Pain in Tripawd Dogs, by TC Wait of Colorado. The American College of Veterinary Surgeons has great information and tips about dealing with your dog’s amputation surgery and recovery. Need help paying emergency vet bills? download this PDF of organizations who might be able to help. Support the Tripawds Foundation to Keep These Resources Available! End-of-life and pet loss resources are available in the Tripawds “Coping with Loss” Discussion Forum. Learn poignant end-of-life lessons from your dog in the Legend of Beezer and Boomer by Doug Koktavy. Get free help from professionally trained volunteers in pet bereavement counseling from the Association for Pet Loss and Bereavement. Includes a live chat, discussion and more. Colorado State University’s Argus Institute offers nationwide counseling for anyone experiencing challenges surrounding their pet’s health care. UK residents may be especially comforted at the Ralph Site, a pet loss support community founded by emergency care veterinarian Shailen Jasani. Author Moira Anderson Allen, M.Ed. has two great articles about pet loss Defining “Quality of Life” and Ten Tips on Coping with Pet Loss. The University of Pennsylvania School of Veterinary Medicine has a Pet Loss and Bereavement for Pet Owners section on their website. For a list of veterinary hospice care resources and grief support counselors, visit Land of Pure Gold Foundation’s Vet Hospice Care page (scroll down about halfway). Check out the Tripawds Gear blog for lots of ways you can help your Tripawd live strong. Research when and how wheelchairs can help Tripawd dogs and cats. Ruff Wear is where Jerry got his helpful support dog harness. Eddie’s Wheels makes wheelchairs for dogs of all sizes including front wheel carts for forelimb amputees. Learn Lessons from a Paralyzed Dog to cope with pet paralysis, mobility problems and geriatric care. Watch our video interviews to learn about prosthetics for three-legged pets. Read all Tripawds News Blog Posts about Prosthetics. Find professional Animal Orthotic or Prosthetic designers. One vet’s opinion about prosthetics for amputee dogs. 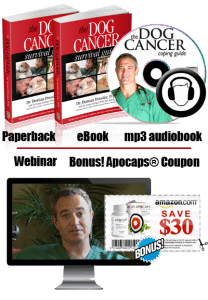 Dr. Demian Dressler’s comprehensive Dog Cancer Survival Kit and Dog Cancer Survival Guide walks you through the cancer treatment journey. Dr. Sue Ettinger gives the latest treatments when amputation is not an option. Rainbow’s Bridge has a good page explaining cancer and chemotherapy options. Veterinary Partners answers questions about osteosarcoma in dogs. The American College of Veterinary Surgeons features information about bone tumors in dogs and cats.. The Canadian Veterinary Journal discusses the uses and benefits of Palliatve Radiation Therapy for osteosarcoma. A great general information site about pet cancer is The Pet Cancer Center. Cat parents can learn about Vaccine Associated Fibrosarcoma and Amputation in Cats at VeterinaryPartner.com. Australian members will find CanineCancer.org.au full of helpful information about pet cancer. Land of Pure Gold Foundation, has awesome information on canine cancer diagnosis, treatments, what to expect and giving programs for financial assistance. www.oncolink.com includes in-depth coverage of bone tumors in dogs and quality of life assessment. Learn about Stereotactic Radiation Therapy (SRT) to treat limb osteosarcoma. The vets at North Carolina State describe Testing Limb-sparing Implants to Fight Canine Osteosarcoma. Be your dog’s hero, help Chase Away K9 Cancer! Diet is one of the most important things you can do for cancer dogs. See Jerry’s canine cancer diet and supplements and other Tripawd Hero diet tips for great examples. Fight your dog’s cancer with K9 Immunity medicinal mushroom holistic therapy. Find cancer information, diet and supplement tips at DogAware. Discover vet-approved holistic cancer treatments at a Path with Paws, presented by Dr. Lena McCullough, DVM and certified veterinary acupuncturist. More holistic veterinarian-approved resources are found at MyHolisticPetVet. For a great summary of Treating Cancer and Immune Support systems, see this summary of the Hoxsey and Essaic Formula Holisitic treatments. The Animals and Artemisinin Yahoo Group exists to support those seeking alternative cancer therapy with Artemisinin, also known as qinghaosu. Help Your Dog Fight Cancer is a website with lots of resources, based on Laurie Kaplan’s books about canine cancer. Find a holistic veterinary medical provider at the American Holistic Veterinary Medical Association website directory. Locate acupuncture specialists in your area at the American Academy of Veterinary Acupuncture website..
More acupuncture specialists in your area can be located at the Chi Institute of Traditional Chinese Veterinary Medicine..
Find international acupuncture specialists at the International Veterinary Acupuncture Society. Learn about canine rehabilitation certification from the Canine Rehabilitation Institute. Find a certified canine rehab therapist (CCRP or CCRT) near you with the CRI Find a Therapist Directory. Learn about the American Association of Rehabilitation Veterinarians (AARV). Find a Rehabilitation Veterinarian (CCRT, CCRP, CERP, and VMRT). In the UK? Find a therapist from The Institute of Registered Veterinary and Animal Physiotherapists. Search All Tripawds Blogs Here. Loving Life On Three Legs is filled with professional tips and tutorials for keeping amputee dogs fit and healthy, now available in the Tripawds Library. Shirley’s Wellness Cafe is huge resource for lots of dog and cat health and pet cancer information. The Dog Food Advisor can help you pick the best food for your dog. 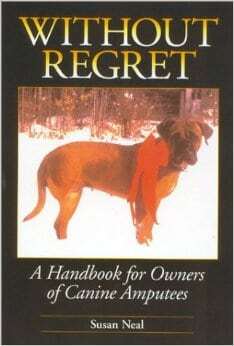 BARF for Beginners by NJ Boxers, answers the Top 50 questions about the BARF diet for dogs. A handy Cat and Dog “BSA / Dosage Calculator” for determining drug dosages. Vet Cancer Clinical Trials is the AVMA Animal Health Studies Database of veterinary cancer trials around the U.S. Comparative Oncology Trials Consortium is network of twenty academic comparative oncology centers to assess novel therapies through clinical trials. *This list is subject to change, please contact Tripawds with any updates. Find More Financial Resources for Help Paying Vet Bills in the Tripawds Downloads Blog! Please support The Tripawds Foundation to help improve the lives of our three-legged dog and cat heroes. Be a Tripawds Advocate! Print your own free cards and flyers and displays to spread the word in your hometown. We love the Morris Animal Foundation for their work in finding causes and cures of pet cancer through veterinary research programs. The Puppy Up Foundation (formerly 2MillionDogs.org) is furthering comparative oncology studies to uncover links between human and pet cancers. Our friends at Greyhounds Rock support canine cancer treatment and research. Browse the Tripawds Featured Blogs for the latest news, gear reviews, nutrition tips, fun gifts and more! The Tripawds Gifts Blog is your headquarters for fun gifts for Tripawd pets and people. Tripawds Three Legged Cat and Dog Blogs chronicle the amazing lives of our resilient members. Christine Davis’ Lighthearted Press offers a selection of magical books celebrating people and their animal companions. These Resources Are Made Possible by Your Support of the Tripawds Foundation.